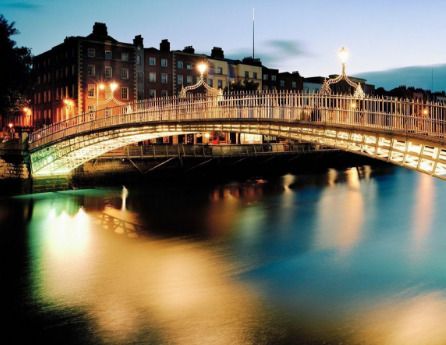 Ireland's Dublin: Paradise For English Literature Lovers! Dublin is the capital of Ireland and consists of many buildings that are from the 13th century. Thing famous for Dublin is its treasure for literature lovers. The Trinity College has the largest library in Ireland. The Library is permanent home to the famous Book of Kells. The 65-metre long main chamber of the Old library is commonly called as the Long Room. The room had to be expanded as the shelves were filled due to the fact that the library had been given permission to obtain a free copy of every book that had been published in Ireland and Britain. The library is huge and is literally a paradise for book lovers so name any book and you can find it there! The James Joyce Tower and Museum is a place where James Joyce spent six nights. James Joyce always created a unique language of invented words, puns and allusions and has a large fan base. There is a tower which contains a museum dedicated to Joyce and displays some of his possessions and is a place of pilgrimage for Joyce enthusiasts. The tower is open 365 days a year and museum is run by friends of Joyce Tower Society. There is an Oscar Wilde sculpture located here at the corner of Merrion Square Park. Oscar Wilde, author, playwright and poet was born in year 1854 at Number 1 Merrion square. The sculptures include three pieces, the stone sculpture of Oscar Wilde, a pillar with a bronze of his pregnant wife and a pillar with a bronze male torso. It captures Oscar Wilde’s colorful personality depicted at age of 40, a crucial time of his life. Wilde is always remembered for his extensive writings, his wit and his dress. The great writer who wrote “Gulliver’s Travels” is buried in Dublin next to Esther Johnson (known as Stella in her writings) who died 12 years before him. Swift first met Stella when he tutored her. The exact nature of his relationship has never been established but Swift never married and was devoted to Stella and wrote a number of poems for her. Marsh’s library is situated in St. Patrick’s close, adjacent to St. Patrick’s Cathedral, Dublin. The library was opened to the public in year 1707 and was the first ever public library in Ireland. The library has a collection of over 25,000 books and 300 manuscripts. Some of the old books and manuscripts are still preserved there and given to the public so many people visit the library in order to see and take some manuscripts. Oliver Goldsmith was an Irish novelist, playwright and poet. He studied at Trinity College, Dublin. His tutor was Theaker Wilder. He was graduated in 1749 as a Bachelor of Arts and later became a famous novelist, playwright and poet. This statue was made as a tribute to him. At the end of St Patrick’s Cathedral stands a long brick wall with arches called literary parade of Irish writers. It was crafted by Colm Brennan and John Coll.The sculptured heads are accompanied by a short biography and set onto arched alcoves of the red bricked east wall of St Patrick’s Park. The sculptures include great Irish writers of all time.